Last week the Santa Chiara Hotel in Rome Square, Venice, unveiled its new wing, revealing a white cube which did not please the Venetian people and a sizable number of national experts. On one hand Rome Square – despite being the gate to Venice since it is the only part of the city which can be reached by car, bus or tram – is not itself an architectural masterpiece. It is surrounded by the controversial Constitution Bridge (popularly known as the Calatrava Bridge), a multilevel parking and the Criminal Court buildings. Moreover, the project of the new wing had been duly approved by the local Superintendency of Fine Arts, the competent Authority. 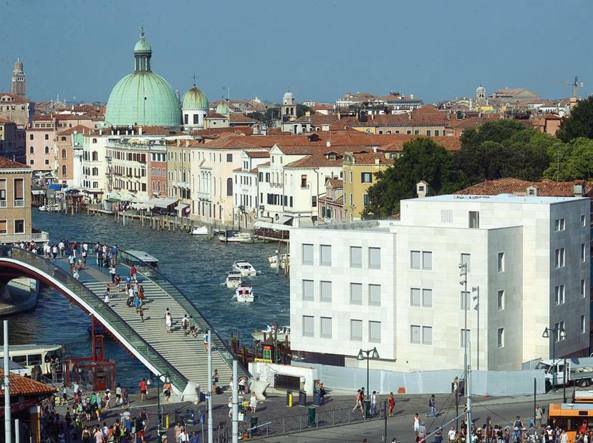 On the other hand, the new building faces the Grand Canal, the unique waterway crossing Venice. Tags: architecture, building, controversy, Piazzale Roma, Rome Square, Santa Chiara Hotel, Venice. Bookmark the permalink.